This New York Times Bestseller receives high praise from many reputable sources (in fact, the first seven pages are filled with glowing reviews and a list of the eight outlets that name it “Best Book of the Year,” including People, Amazon, Time, Booklist, etc). However, my review of Kevin Wilson’s novel slightly differs in tone. 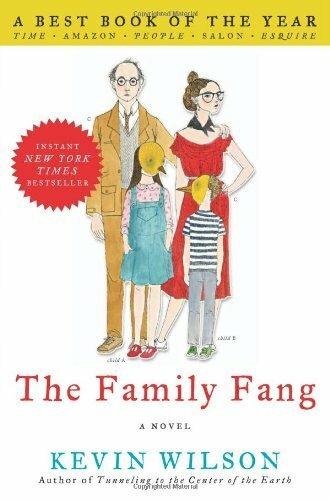 I can’t call The Family Fang a favorite read of mine, but if you are super interested in the premise and enjoy quirky reads, you will likely stay interested and reading. The premise itself. Briefly: Annie and Buster Fang are born to artist parents that immediately incorporate them into their bizarre, public spectacles that create chaos and thus, “art”. One example of their public art: As young children, Annie and Buster poorly play instruments in front of an open guitar case that features a handwritten note reading “Our dog needs an operation. Please help save him.” They continue playing and singing as onlookers react sympathetically until their parents, posing as independent strangers, begin yelling insults, accusing Annie and Buster of being “terrible,” and just generally harassing the children. The fallout and reaction of the audience – bizarre in and of itself – is recorded and functions as the Fang art. The performance art just gets weirder and more spectacular, but definitely works as the best part of the novel – it’s fun to see what the Fangs will concoct next and how the performance will pan out in the public arena. The twist. Obviously, I can’t discuss this at length, but about halfway through the book, events take an interesting and unpredictable turn. Wilson keeps you guessing, and the pay-off is satisfyingly nuts. The plot structure. The novel flashes back from performances as Fang kids (Child A and Child B) to Annie and Buster’s current adult lives (she’s an actress, he’s a writer) as they reconcile how their past consistently affects and molds their adulthood. Sometimes flashbacks in novels bum me out as they delay the present action, but I eagerly read the flashbacks in TFF – again, they provide some of the best moments of the story. The (mostly) inventive writing. The reason this book receives such high praise is because of the layered, metaphoric, original, and well-executed writing. I thought a bit of that came across as heavy-handed, but I see the merits. If I were a college professor, I would certainly consider assigning this novel in a Contemporary Lit course because of the novel would definitely produce very rewarding discussions. Characters lacked likability. You may disagree with me after reading, but I was never fully invested in Annie and Buster, perhaps because Wilson’s writing felt a bit cold to me. The twist ending (which, as an impartial observer, I appreciated and enjoyed for its cleverness) did not really evoke any personal emotions whatsoever. Don’t get me wrong, I kept reading and did want to see what happened, but I missed having characters I loved and wanted to see fulfilled at novel’s end. Cliches regarding character. Yes, aspects of the writing are extremely well-written (and the plot itself is just about the opposite of cliche), but especially in their adult lives and romantic relationships, Annie and Buster as characters were a bit predictable. I probably held Wilson to a higher standard based on the book’s prestige, but the main protagonists certainly fit the “scarred as children, now unsuccessfully functioning as adults” mold pretty solidly. Sections of language and other adult plot turns. This book is pretty much a nursery rhyme compared to some other popular reads right now (I’m not reading 50 Shades of Grey, so no review is forthcoming: sorry!). And honestly, The Family Fang would simply be rated a medium PG-13, but I still would not recommend to young readers, no matter how they think they might relate to the premise of crazy parents (and no matter what the title implies, no vampires are involved)! However, adult readers should not hesitate based on that reason alone. Here’s the bottom line: I wouldn’t pick this book up and read it again, I didn’t fall in love with it by any means, but I won’t forget it (and I certainly won’t ask in several years, “did I read that one already?”). The Family Fang is memorable and will stick with you, even as you may not be 100% emotionally invested.